34-year-old Irawati lives with her husband Sellamat and their two children who are eight and three-years-old. She is expecting her third child in April 2019. The family lives in a village called Puroo in the Lindu region of central Sulawesi. 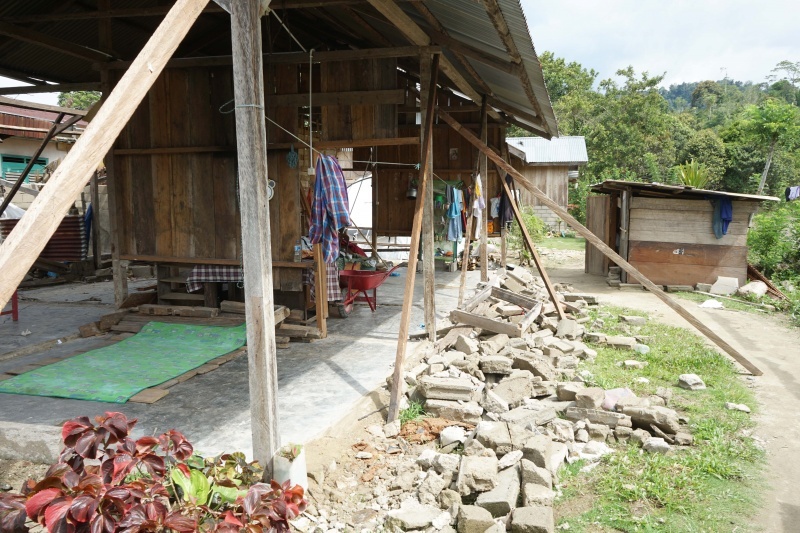 When the 7.4 magnitude earthquake struck the island, they were all at home. In an instant their house was crumbling around them. Sellamat said he quickly gathered his family and took them out of the house. The ground was shaking so violently that every time they tried to stand up they fell back down, so they crouched on the floor trying to run at the same time. We were eating dinner and the concrete fell inside, but the bathroom wall fell outside, so we went out of the bathroom, we were lucky. Later that evening, everyone from Puroo gathered near the main school which was totally destroyed by the earthquake. They built emergency shelters out of anything they could salvage in the dark. The whole community stayed together that night. The family stayed in the emergency shelter by the school. Everyone shared their food and supplies they already had in their homes, anything they could pick out of the debris that was worth saving. Puroo, which is about 60 kilometres from the city of Palu, had been totally cut off by landslides, the only road into the village was inaccessible, it was difficult for anyone to reach the community. The whole community cooked, ate, and slept together the first week. By the fifth day we started to get supplies from the government, but we only got noodles. This was almost five weeks after the earthquake. She then described the house as being too dangerous and completely unstable. The wooden structure remained but it looked like every bit of concrete that had been used to build the house had crumbled into dust, it was just a broken skeleton of what once was a family home. Irawati and Sellemat were given a ShelterBox tent, water carriers, a water filter, and a mosquito net. The tent has enabled them to move out of the emergency shelter and closer to their home with their two children. The tent is nice, we feel very comfortable and we get a good night’s sleep now. Not too hot, not too cold. We feel safe… And no more mosquitoes!